Travel bags are about one word. Protection. It’s simple but important. If you’re going to play golf and travel, your clubs must arrive safely. A broken driver is not only costly to replace, but also ruins your mood and maybe even your vacation. Investing in the very best to protect your clubs is an absolute must. One key to our testing protocols is that we test products head-to-head. We select the top products from each category and put them through extensive and detailed head-to-head testing. We test both in the lab and in the field. We score each product across a range of weighted categories. We then rank the products, explain why products finished where they did, and give awards to the best-performing products in the category. For travel bags, our scoring centered around the protection of clubs and the durability of the bag. The possible storage within the bag and the storage of the bag after use were also considered. Maneuverability – especially through airports – was tested too. We put in hours of testing utilizing data-driven protocols to test new metrics. The metrics and attention to detail are better than ever. To determine the best test travel bags, we prepared a golf bag with any and all possible gear one could need while traveling. We included 1 Set of Alignment Sticks, 1 Box of Golf Balls, 14 Clubs, 1 Umbrella, 1 Pair of Golf Shoes, Tees, 4 Gloves, 1 Set of Rain Gear, and 1 Rangefinder. Once the bag was prepared, testers loaded and unloaded the travel bags. They were then asked to walk around pulling or pushing the bag as they would through an airport. Tester survey questions centered around whether or not the tester was comfortable with the protection of their clubs. While travel bags serve other minor purposes, this is their most significant function. Durability (25 points) – To determine durability, we evaluated the stitching of the bag along with the material used. Regardless of what you’re buying, you expect it to last. Travel bags, especially because they’re used so infrequently, need to be durable enough to last several years. Some bags are made of inexpensive materials, while the top performers in this category offer highly-durable wheels, zippers, buckles, and materials. 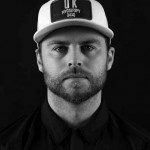 Packing (15 points) – Quite simply, how much gear can the bag hold? Many of our testers mentioned that they used their travel bag as extra storage on the flight. Given airline fees these days, we’re on the same page. The best bags in this category offer room for the necessities, as well as plenty of room for extras. Maneuverability (10 points) -How easy is it to load and unload the bags from the car? How easy is it to move through the airport? We closely examined the design of the wheels, the handle placement, as well as the structural base of the bag. Bags that performed poorly were awkward while walking. The top performers not only made for easy walking, but were also able to stand without assistance. Bags that were more stable through the middle section generally performed better. 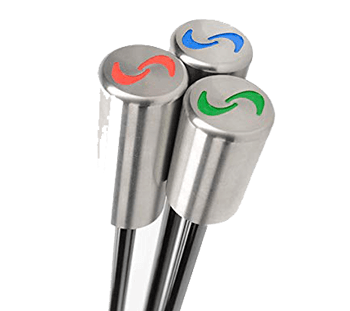 Protection (45 points) – Your golf clubs are a significant investment. A travel bag then must protect your clubs in every situation. We closely examined the top portion of the travel bag because it is where clubs are the most vulnerable. 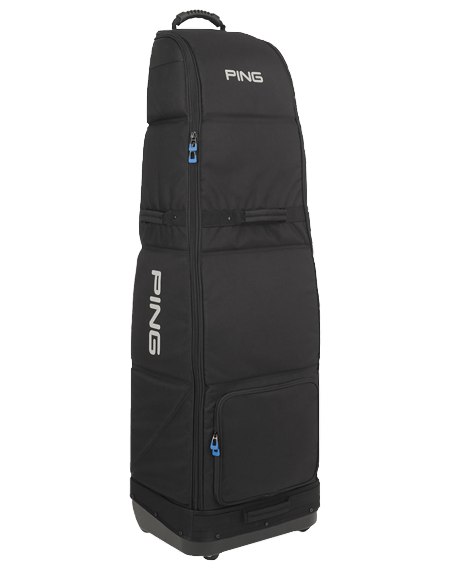 Manufacturers use a variety of different methods to protect the clubs, but one constant is that poor performers lack coverage on the top and sides of the bag. The bags that provided effective protection do so by combining protective padding with a snug fit. Storage (5 points) – When you put your travel bag in a corner of your garage, how much space does it take up? Some bags simply fold up, while others are designed specifically with space-savings in mind. Final grades were awarded based on total scores. Best Overall is our highest overall scoring travel bag, and awards are given to the top three bags. Also, more specific Best in Class recognitions are awarded to bags in certain categories (like maneuverability, protection, and durability) that push the industry’s design envelope. Sun Mountain claims the top spot for the second year in a row. Thanks to its 4-wheel design, the maneuverability of the bag from the car to the terminal and through the airport is second to none. It offers outstanding protection to keep your clubs safe once you’ve surrendered them to the airline. 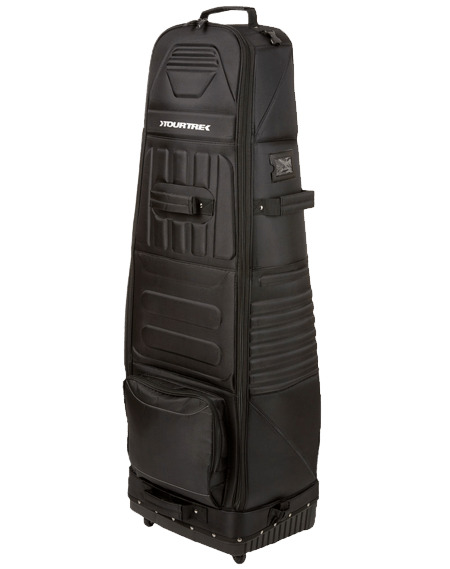 The Tour Trek Flex is a great bag for the player who wants value for his money. The 6-wheel system allows for stress-free maneuverability when rolling the bag in and out of the airport. The Flex folds up to a size of a briefcase making for less clutter when stored. For the price, Tour Trek Flex will not disappoint. 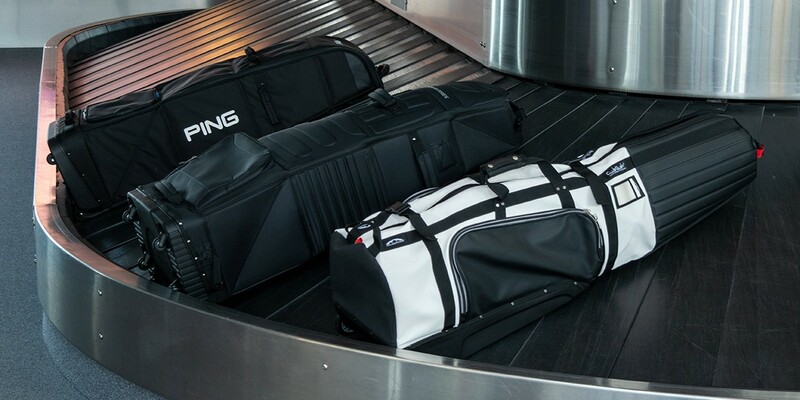 The PING Rolling Travel Cover makes getting clubs in and out of the bag effortless. 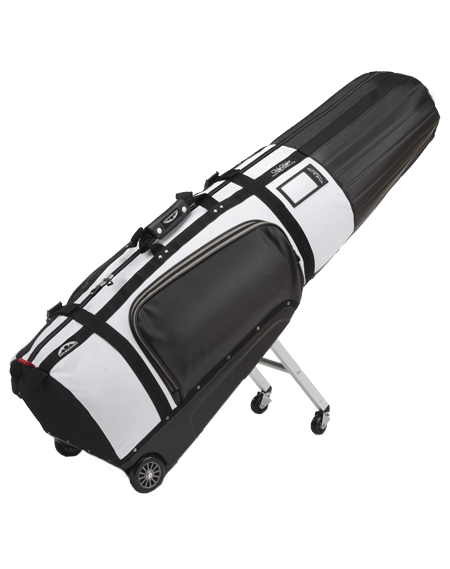 The outside material is durable, and the abundance of padding on the interior will keep your golf clubs protected and safe from all but the most aggressive baggage handler. The 4-wheeled design allows the travel bag to be pushed or pulled with ease. I bought a Club Glove travel bag along with 2 matching CG rolling duffles. The Train Reaction System makes navigating through airports with 2 bags and the clubs very easy. 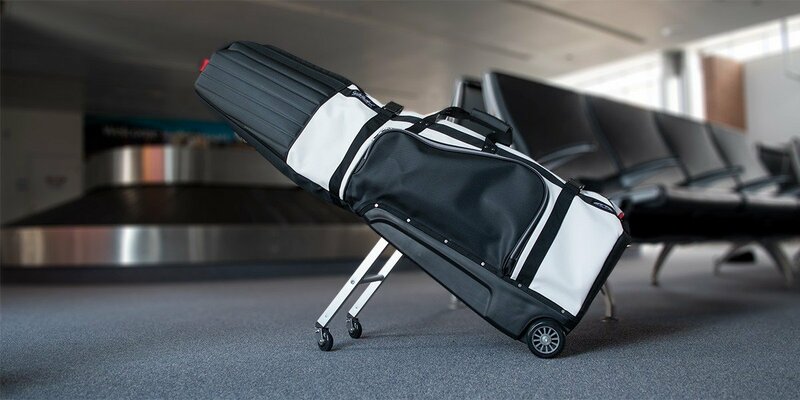 Great looking durable and easy rolling makes this luggage perfect for golf on the go. I have the Clubglider. Absolutely love it. Easy to distinguish when it’s coming up the baggage claim. Rolls like I’m ice skating, takes ZERO effort to maneuver on sidewalks, parking lots, and inside airports. CONS-bottom just got punctured on last trip. Wheels got caught in space between train and track, almost lost a leg. It’s heavy. I think 13lbs, you can get to 50lb airline limit quick. Are any of these travel bags TSA approved? The test should include is putting them on a plane and see how they survived. I don’t know about anyone else but the airlines do a job on breaking locks attached to the travel bag. I have an SKB and a Clubglider. Clubglider gets destroyed/ripped a little more every time it’s been on a plane. IMHO, it just isn’t going to last more than probably 3 years at best (this is the 2nd year I’ve had it). I’ve found that it IS NOT durable. What I wish is for a clubglider that had that hard plastic all around the bottom 12 inches or so of the bag – which is were it always gets ripped up by the airlines. The SKB hard case is a tank, but the bottom wheels got destroyed by the airline the second time I used it. I wrote SKB, and they send me new wheels and hardware to replace the old stuff. Unfortunately, the old wheels were riveted into place, so I had to drill them out – that was a bit of a project. Otherwise, you can see the beating the case has taken but has really held well. The drawback to the SKB is that you can’t fit it in a normal trunk of a rental car – it’s just too big. Since it’s not flexible, you can’t nudge it in. I only take my SKB if I know that I’m not going to be renting a car, of if I’m going to be getting a van or SUV. Sorry, but you can’t exclude the Club Glove, when you know it is the bag every reader will compare your choices to. Please go back and compare with the most popular bag out, instead of sending us links to a 2017 article. Pros/cons and where Club Glove falls short compared to your top pick please. I have the Clubglider and have had a great experience with the product, but I do find main compartment a little small. Was very difficult to get my Nike stand bag in there on a recent trip. Luckily, I have a Jones bag so used that instead of the Nike. Once I did that, Clubglider closed easily and performed very well. Wheeled stand a really nice feature. Why did you choose not to include any hard travel case in your list? I’ve had airlines destroy clubs so many times when using soft cases (including some on your list), that I just no longer trust anything other than a hard case. In soft cases I’ve had club damage ranging from drivers snapping from end-on-end impact though to iron shaft damage from the bag being squashed like a pancake. Never had a problem when using my hard case. Ive no affiliation with SKB, but personally I go for the SKB Delux because it’s very strong, a good size, and when packed it fits within airline weight limits. “Coffin” cases protect the best, however, I’ve had people in my store buy them. then can’t get it into their car! When you rent a full-size car, you really get a midsize, and the hard case won’t fit in the trunk and if there are more than 2 on a trip, you need another car. I had the Bag Boy T-700 for a few years before selling it to a friend and buying a T-750. Great bag, never an issue. These oversized bags aren’t practical for planes and taxis. DIY with a club glove way better. I had a Clubglove Last Bag for years and it was very good. Howrver it was bullkier and mote difficult to handle than the SM Clubglider. With so many long tracks from baggage claim to the car rental and having to ger on and off shutles it so nuch easier to roll. One of the areas where it doesnt get enough credit is in the Ticketing checkin line. Previous bags would topple over or you had to continually pick up and move. With rhe Clubglider just keep it in the dowin postion and it moves easily through the line. These oversized bags aren’t practical. Titleist professional is one of the best. Durable, featured, and good attention to detail. Club Glove is also a great one. Awesome durability. I wish you had included the total weight of the travel bag and golf stuff to show how much over or under the airlines weight limit they might be. Thanks for the nice reviews. Fly Southwest, no bag fees. What about when you fly internationally? I’m with you. I have an Ogio Monster and while I thought I’d never want another bag, we live in 500sq feet now, so storage is at a premium. And its weight is a liability from a packing standpoint. I can only get a dozen balls, my 14 club bag, and a pair of shoes in before I hit the weight limit. Really interested in options 2 and 3, but total weight would be helpful! Any testing to see how well the bags actually protect clubs (drop test etc.)? Not sure if I missed something but I didn’t see anything about testing the Club Glove travel bag. I’ve had one for a few years and it’s been outstanding. An incredibly durable bag: They were awarded the “Most Durable Travel Bag of 2017”. However durability is just one job a travel bag has and we feel this years top 3 are better bags overall at doing all that is asked for based on consumer feedback and testing. Agreed! I’ve had their Last Bag for 10 years and I haven’t been disappointed. I have traveled with it mostly on Delta and haven’t had an issue. It is durable and protects. What more can you ask? Has anyone tried the Club Glove Train Reaction System? I would consider it. I agree, the Club Glove bags are terrific and if I’m not mistaken they are the most popular travel bags on tour as well. Don’t understand why they aren’t included in the test. I’ve used both their J hooks and train reaction systems and liked them a lot, especially the J hook for use with the golf travel bag and a suitcase. Incredibly easy to wheel around and makes travel a lot easier. Club Glove is the gold standard of this category. They make an incredibly durable bag as you can see from last years guide. They were awarded the “Most Durable Travel Bag of 2017”. That being said we do not feel they are the best travel bag overall. Sweet review. I really wish I had this before I got my travel bag. Traveling through a big airport with long walks towing a crappily designed travel bag can really put you in a bad mood. I don’t even dare to leave my driver head on and pull my putter too. Storage is way over rated, my opinion of bags not the review, you can stick your shoes in your regular bag I recommend wrapping your towels around your irons to prevent them from beating up your woods and hybrids. Will any of these travel bags hold a Cart or staff bag? It seems like all testing was done using a stand bag. Thanks for the reviews! I have a older Bagboy similar to the T-10, but without the hardshell top. It holds my cart bag, but generally I travel with an older stand bag. I’d agree with the maneuverability being poor, but I think the storage and durability are very good. When my wife and I went to Hawaii this winter, I was able to fit my clubs, both our shoes, rain gear, 3 dozen balls, and I still had space in the pockets. That said, I ALWAYS take off the heads of my Driver and 3W and putt them in pockets of my golf bag. Even with the Stiff arm, I figure why take chances. Just realized I confused Storage for Packing. The packing is great, as I mentioned above, but the Storage is horrible. basically doesn’t break down at all. I store it up on a hook in the garage with the stand bag I travel with in it.